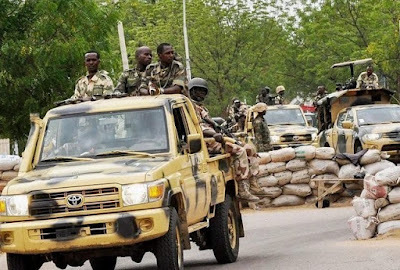 Nigerian army has vowed to deal with Igbavbou Lucky, a private in the Nigerian army, who was arrested over his alleged involvement in cultism. Lucky was among the 103 suspects arrested and paraded by the Edo state police command at a press briefing. The soldier was apprehended at Ekpoma, while celebrating his birthday with other suspected cult members. He was reportedly dressed in a army camouflage trouser and vest at the time of his arrest. “The attention of Headquarters 4 Brigade Nigerian Army has been drawn to a media publication dated 23 March, 2019. In the said publication, it was alleged that Private Igbavbou Lucky was arrested and paraded by the State Police Command for occult activities,” the statement read. “For emphasis, Nigerian Army (NA) is a professional organization with extant policies that regulates the conduct of its personnel. The NA does not allow any of its personnel to belong to any confraternity such as cult groups and related associations. Consequently, any of its personnel who crosses the red line in this regard will face the full rigour of military discipline.